A large corporation enlisted Avalon Group to elaborate requirements for a new product. Our writers gathered information from the Subject Matter Experts (SMEs), crafted requirements, and documented them within the client’s existing standard. 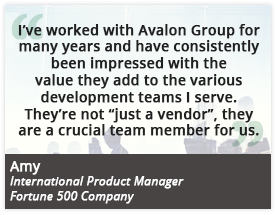 Once the requirements were fully defined, Avalon Group completed the effort of tracing the requirements to test cases to facilitate the product testing process. Due to our intimate knowledge of the product, Avalon Group was the logical choice to write the user manual. We were able to work independently to complete the work efficiently with minimal SME involvement. Our methodical approach to the development of user documentation, with a task-oriented focus on the needs of the user, and our familiarity with the product yielded an accurate and effective manual. Avalon Group then leveraged our extensive knowledge of the product to design and develop a troubleshooting guide for use by customer support personnel. Again, Avalon Group’s knowledge of the product and expertise in developing troubleshooting documentation ensured accurate and effective documentation, saving time and money for our client.